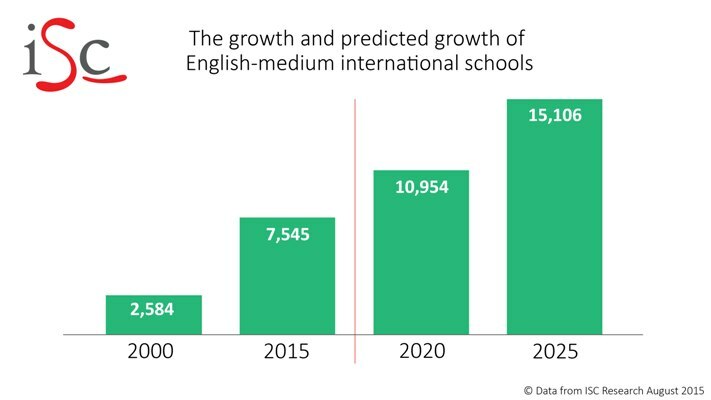 The K-12 English-medium international schools market is now considered a crucial sector for the world’s higher education institutions. The aspirations of pupils that go to these schools and the academic, personal and English language skills that they acquire mean they are now considered by many university recruiters to be one of the best sources worldwide for future students. And according to the latest data from the International School Consultancy (ISC), this market is healthier than ever and looks set to expand rapidly for the foreseeable future. Today we present a guest post from Anne Keeling, who works with the team at ISC. She handles their media relations and specialises in writing about international education. Working directly with international schools in Malaysia, Singapore and Hong Kong, the university has been building relationships with international schools for many years. This has involved regular visits to the schools from both recruitment and academic staff. The university is exploring newer markets, such as India as well, and is focusing on developing one-to-one relationships with individual international schools. The enrolment team at John Cabot specifically targets international schools that offer the International Baccalaureate, Advanced Placement, or A-levels exams and that are within a three-hour plane journey of Rome. “Parents want their children to be fairly accessible,” explains Ms Anderson. Regions in the world with a high density of international schools are those that are most often targeted directly by universities and colleges. “A select few reputable, third-party agents are occasionally used by international schools, particularly small schools and those in remote locations that are difficult for universities to access directly,” says Diane Glass, Business Development Manager of ISC who specialises in supporting the university admissions market with data and market information. ISC is the leading provider of data and market intelligence on the world’s English-medium international schools market. Research from ISC suggests that the market is expanding significantly, with many countries in Asia growing at a steady pace, and with no sign of saturation. 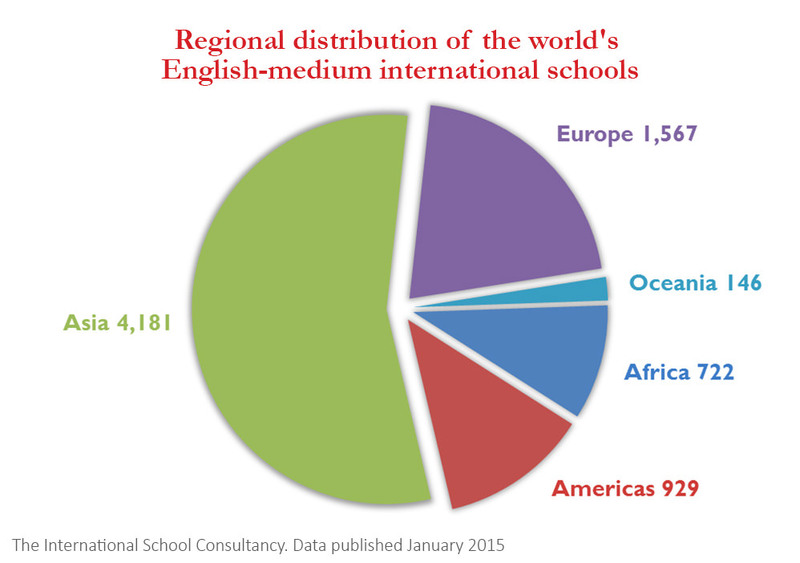 ISC data indicates that there are now 22 countries globally with over 100 English-medium international schools, some of which have significantly more. The UAE leads the world with 507 international schools teaching over 455,000 students. As many as 245 schools are located in Dubai alone. Even with such extensive options, competition for the best schools remains high. The National Curriculum of England is the most popular curriculum choice and is offered (all or in part) by half of all international schools in the UAE. A US-oriented curriculum and the International Baccalaureate are also widely offered. China, meanwhile, is home to 480 international schools – for such a vast country, this may seem like a relatively low number. A large part of the reason for this is that most of China’s first international schools were foreign-owned and were established to respond to the needs of expatriate children. With few exceptions, these schools are still not allowed to enroll local children. However, there is a rapidly increasing demand from Chinese parents for an English-medium education for their children, and the international schools landscape in China is changing in response to this demand. The number of Chinese-owned international schools is growing fast and, crucially, local children are allowed to attend these schools. Egypt and Nigeria in Africa. “All of these countries are experiencing significant demand for international school places,” says Ms Glass. “Much of this demand is coming from local families who want a high quality, English-medium education for their children so that they can achieve a place at a respected English-medium university. Target the schools carefully. International schools vary in the range of curricula, examinations and orientation they offer. They also vary in the demographics of their students. Develop a relationship with the career and guidance officer or counsellor within the school to build rapport and to get to know the needs and potential of that school. Look for international schools that are accredited or are members of leading associations, and that have a good reputation for their standards of learning and teaching. Some of the larger, leading international schools are inundated by requests for visits by individual universities. So much so that it becomes a problem to handle. Try to work collaboratively with other universities in your country or region to offer the school a coordinated visit, allowing students to learn about a broad range of universities at one time. Many international schools have strict policies which prevent third party agents from approaching their students or their schools; some counsel their students and families against using non-approved agents, while some work with reputable agents and organisations that provide particular support services. Further data and research services dedicated to the international schools market are available from ISC. These include an online licence providing market information, school data, search facilities, and contact options. For more information, please visit ISC or contact Ms Glass directly. This entry was posted in Africa, Agents, Argentina, Asia, Australia, Australia/Oceania, Brazil, Canada, China, Egypt, Europe, France, Germany, Hong Kong, India, Indonesia, Italy, Japan, K-12, Malaysia, Mexico, Middle East, Most Popular, Netherlands, Nigeria, North America, Pakistan, Qatar, Regions, Saudi Arabia, Singapore, South & Central America, Spain, Sweden, Switzerland, Thailand, UAE, United Kingdom, United States and tagged colleges with international students, undergraduate student recruitment, high schools abroad, primary schools abroad, study abroad.